Ann M Holmes grew up on the tranquil Leicestershire-Rutland border, where as a farmer’s daughter, she filled her time roaming the pastural landscape looking for subjects to paint or draw. In her teens, she discovered the work of the great documentary photographers Cartier-Bresson, Sebastiao Salgado and Chris Killip (among others) which she found to be emotionally powerful and chime with a certain monochrome graphic quality she had always sought to create in her own drawing. When a kindly neighbour gave the teenager his old darkroom apparatus, she began to take pictures and explore the film and print processes of the day, commandeering the family bathroom for selenium toning. Inevitably, Ann’s natural impatience and keenness to embrace an immediacy in image making would result in her switching to photography exclusively. Ann lives in picturesque Hebden Bridge, a Yorkshire mill town in the heart of the Pennine hills in Northern England. 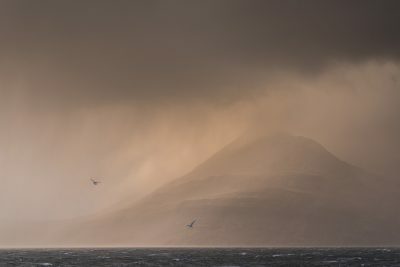 Whilst her photography often reflects the rich variety, heritage and detail within that landscape, feeling landlocked, she has also begun to explore some of the UK’s most remote coastal locations which by their very geography, attract the most inclement of weathers and dramatic light. The aim in her land and seascape work is to capture something of the sublime emotional response felt at the time that the shutter was deployed and working from before dawn through to darkness itself she believes is necessary to produce photographs with the maximum impact. Shooting landscapes and working within the whims of the natural elements demands one adopt a patient openness and go-with-the-flow approach which Ann believes is also key to working in other photographic genres.